StatMap Aurora is a complete solution allowing users to build location-aware applications to solve common business problems with no programming required. 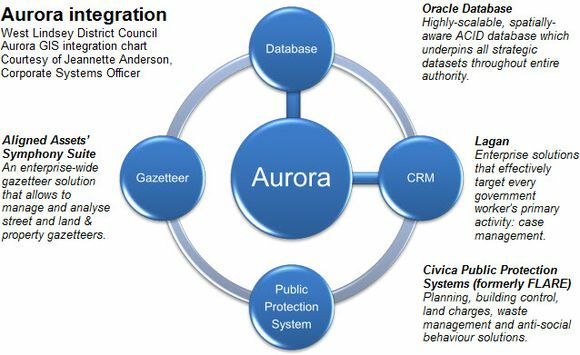 Aurora is efficient and cost effective and can be used without the need to employ expensive consultants or software developers. Fully configurable – Design your customized applications in just a few clicks. Change colours, add custom tasks and publish new maps or integrate Aurora with other systems in a few simple steps. Unrivalled performance – Enjoy the Earthlight performance in your public GIS. The highly-scalable sub-second drawing engine which powers Earthlight is also used for Aurora rendering. Engaging experience – From high quality maps and symbols to smooth viewport animation and live address search, Aurora delivers an engaging, high-quality experience throughout the whole application. Prepopulated forms – Enhance data quality and decrease data entry time by prepopulating forms with the user address. New addresses can be automatically added to the form by providing even a partial address. Instant gazetteer access – Search your gazetteer instantly and display geocoded locations with ease. Search as you type feature provides immediate results. Partial address matching – Smart address matching finds desired addresses quickly, even for incomplete, bad-formatted queries. Whether the postcode is SW16 2LD or just sw162ld, Aurora will correctly recognize and process it. Built-in form editor – Create a customized user forms with your own fields, watermarking and user hints. Control every aspect of forms by drawing them from scratch or just specify desired fields and the layout will be generated automatically for you. User input validation – Ensure data quality and business constraints thanks to input validations. No more empty telephone number fields or missing address information. Last address memory – Avoid unnecessary typing and allow the user to enter her address just once. The address will be preserved between visits but no sensitive information is stored on the local system. High quality maps – Publish complex thematic layers, engaging terrain maps or high detailed aerial photos in an easy, unified way. No more hacking to create an informative collage from various layers – just mix and match whatever you want. Links and images – Enrich your search results with links and images. Adding pictures of monuments and buildings or providing direct links to libraries’ websites has never been easier. Accessibility – Ensure ease of access to your information for visually-impaired people. Scalable fonts, high-contrast settings and text reader APIs provide a high level of accessibility. Symbol gallery – Dazzle your users with high-quality, true-colour symbols with semi-transparent shadows which were designed specifically for your industry. Additional symbols will be provided by StatMap upon requests completely free of charge. Customizable prints – Define customized print templates and take full control over their contents, styles and copyrights. Merge search results like addresses with maps and graphic to provide compact yet specific documents. Drill-down ad-hoc queries – Give the user a power of exploring her neighbourhood interactively, by just clicking around on the map. Full, comprehensive and localized reports will be delivered to the user’s browser in the blink of an eye. Find nearest queries – Define complex queries involving dozens of layers. Just select required layers, specify buffers if needed and enjoy blindly-fast queries in your Aurora applications. SI and imperial units – Don’t force the users to choose between metres and feet. Results are always displayed in imperial and SI units. Apply or report – Build workflows and tasks which allow the user to report new issues or apply for additional services. From reporting abandoned vehicles to applying for bulky items collection – everything can be set up instantly without programming. Earthlight authoring tool – Publish new layers, forms or reports instantly straight from Earthlight. Changing any aspect of Aurora application can be accomplished within minutes straight from the web interface of StatMap Earthlight. CRM integration – Link Aurora with your CRM and enjoy a hassle-free data transfer of public queries straight into your back-end systems. The direct connection allows live integration of public Aurora GIS applications with your existing infrastructure. Data propagation – Push user data gathered by Aurora throughout your whole organization. The fill-in reports or user queries can be automatically send via email, stored directly in the database or instantly pushed to your CRM.